Base Squad 49, also known as Base Square 49 on its Steam Greenlight page, is a newly released budget title on Steam from developer/publisher Arthur Kariev, his debut creation. The trailer for this latest Unity lane defense style action game didn’t quite make it appear anything all that engaging to the player, speaking more to those looking for some quick achievements and trading cards for resale or badge purposes. That said, it could still be a fun little romp if the execution is done well. So, does this one do just that and make itself worth of that dollar, or is it better left sitting in the digital budget garbage bin? 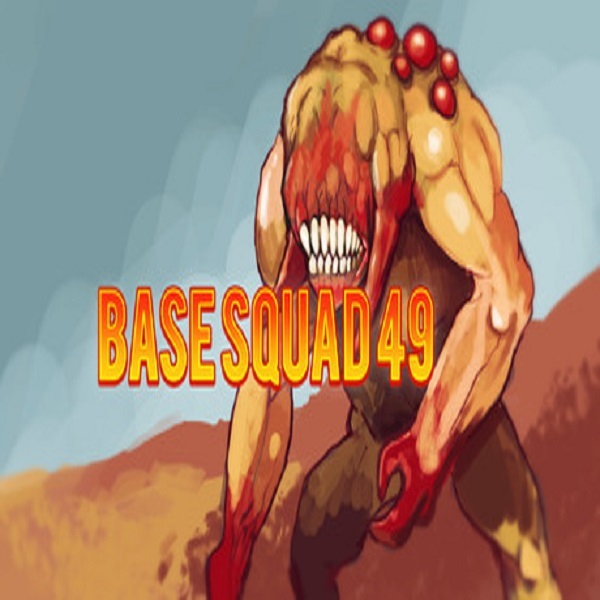 Base Squad 49 pits you against hordes of demons trying to break into your base. You are armed only with a pistol and two slow firing turrets atop it, both upgradeable. As you grind away, you collect cash for all shots that hit the oncoming horde, all of which carries over every time you restart. The goal is to manage these funds towards building sturdier walls and fortifying your base’s weaponry to stand a better chance. While the walls and guns are simple enough to unlock once you reach a certain wave, the base unlocks don’t seem to become available. The second said I needed to reach level eight, but I was on level twenty-four. While the weapon upgrades are straight forward to unlock, they are pretty much trash. You only get a minimal amount of ammo for them, often being just ten shells, which replenish every wave, or by replenishing from the ammo button on the top right of the screen. You can acquire a chain gun from right clicking the giant gold stars from enemy drops, similar to picking up bonus cash in wooden crates with a question mark on them. Sadly, it only lasts a few seconds, much like the initial first wall you build. In order to really survive early on, you need to constantly repair that wall, making it seem like building up a stockpile of money before even doing so is the best idea to combat having to navigate your character to attack and initiating the repairs at the same time, which is just infuriating. And then there’s the hit detection issue. It’s unclear to me if this is intentional or not, but a number of bullets just seem to whiz through your foes instead of making contact and causing damage, adding to the stress of having to grind to survive for any extended period of time even more infuriating. Thankfully a simple auto clicker program pointed to the right spot on the screen will save you hours of sitting there watching the demons destroy your base over and over, allowing you a chance to get up and do something more with your life. Of course, when you actually build a wall, the bullets seem to make contact even less, allowing the hordes to reach/destroy it insanely quick. Even the smallest of foes seem to take a minimum of seven hits to take down, which wouldn’t be so bad if they didn’t reach the base so damn quick in the first place. Other than that, the graphics just look terrible, the sound effects are stock or stolen (the shotgun sounds like it was ripped straight out of the original Doom game) and the enemy movements are laughable. Then there’s the frame rate issues, as all your foes leave blood behind when they die. The more blood on screen, the more it lags, requiring a computer with much higher powered hardware than what’s listed on the store page. Even if you do have anything better (like I do), you’ll still find your rig struggling to keep up, dropping from a steady thirty frames per second all the way down to nine by the time I reached the point of not caring, which just so happened to be wave twenty-four. That was also about fifteen more waves than the game’s score allowed as it seemed to end by the ninth (though this includes times I had to restart) and I was left with silence a good majority of the time. It was a problem until the wall was maxed out, the frame rate plunged further into the depths of hell, and walking away for five, ten minutes became a possibility without killing my character and losing my progress. Even for an early access title, Base Squad 49 is just too simplistic and buggy, not to mention oversights like “Wall title” or “Base title” showing text from a template that was probably from a prebuilt Unity asset Arthur probably forgot to remove before publishing. For ninety-nine cents, no, you can’t always expect anything great, and this one proves that train of thought. It’s boring, incredibly repetitive, and has no actual sense of completion given how it slows down and almost forces the gamer to lose interest and quit before any sort of resolution or pinnacle for bragging rights can be met. Hell, even Digital Homicide’s use of assets from the Unity marketplace offer up some sort of overall value to their titles as of late that makes replaying them appealing to gamers looking for a quick playthrough here and there. If a flip isn’t exacty the case for Base Squad 49 and it was largely programmed by hand, then this title needs a lot of work before it’ll become at all enjoysble, and by that I mean scrapping the original coding entirely and building from the ground up again.